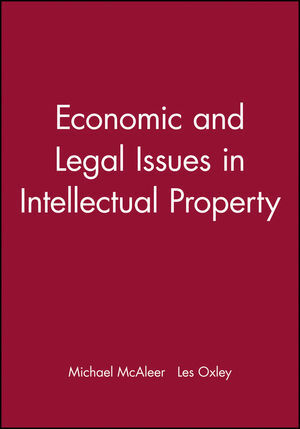 Nine scholarly papers examine the economic and legal issues fundamental to the intellectual property debate. Topics include economic incentives to innovate, copyright law and infringement, trademarks, IP rights for artists, indigenous knowledge and university research, new knowledge economy and society, country risk and innovation, and legal protection of IP. Michael McAleer is Professor of Economics (Econometrics) at the University of Western Australia in Perth. Les Oxley is Professor of Economics at the University of Canterbury, New Zealand, and Adjunct Professor at the University of Western Australia. 1. Intellectual property and economic incentives: Michael McAleer and Les Oxley. 2. Real options and patent damages: The legal treatment of non-infringing alternatives and incentives to innovate: Jerry Hausman and Gregory K. Leonard. 3. How to best ensure remuneration for creators in the market for music? Copyright and its alternatives: Stan J. Liebowitz and Richard Watt. 4. What’s in a sign? Trademark law and the economic theory: Giovanni B. Ramello. 5. Copyright and artists: A view from cultural economics: Ruth Towse. 6. Indigenous knowledge and intellectual property: A sustainability agenda: Dora Marinova and Margaret Raven. 7. University research, intellectual property rights and European innovation systems: Bart Verspagen. 8. Beyond the hype: Intellectual property and the knowledge society/knowledge economy: K.C. Carlaw, L. Oxley, D.C. Thorns, M. Nuth and P. Walker. 9. How does country risk affect innovation? An application to foreign patents registered in the USA: Suhejla Hoti and Michael McAleer. 10. Intellectual property litigation activity in the USA: Suhejla Hoti, Michael McAleer and Daniel Slottje.